« Small Tarts Have Big Hearts! To brighten up everybody’s day at work, I made a batch of iced heart shaped cookies. I used my all time favorite Christmas cookie recipe, which I found in an old issue of Vegetarian Times (and it can be found here), and paired it with the royal icing recipe from Vegan With A Vengeance. These cookies marked my first attempt at “flooding” icing, and I couldn’t have been more pleased with the results! I hope that everyone enjoyed a sweet day! Food coloring1. Preheat oven to 325F. Coat baking sheets with cooking spray, or line with parchment paper or silpat mat. Combine flour and baking powder in small bowl. Whisk egg replacer with 2 Tbs. water. Set aside. 2. Cream sugar and margarine in bowl with electric mixer until fluffy. Beat in vanilla. Add egg replacer, and beat until smooth. Add flour mixture, and beat until soft dough forms. 3. Divide dough into 2 balls. Roll one ball to 1/4-inch thickness on lightly floured work surface. 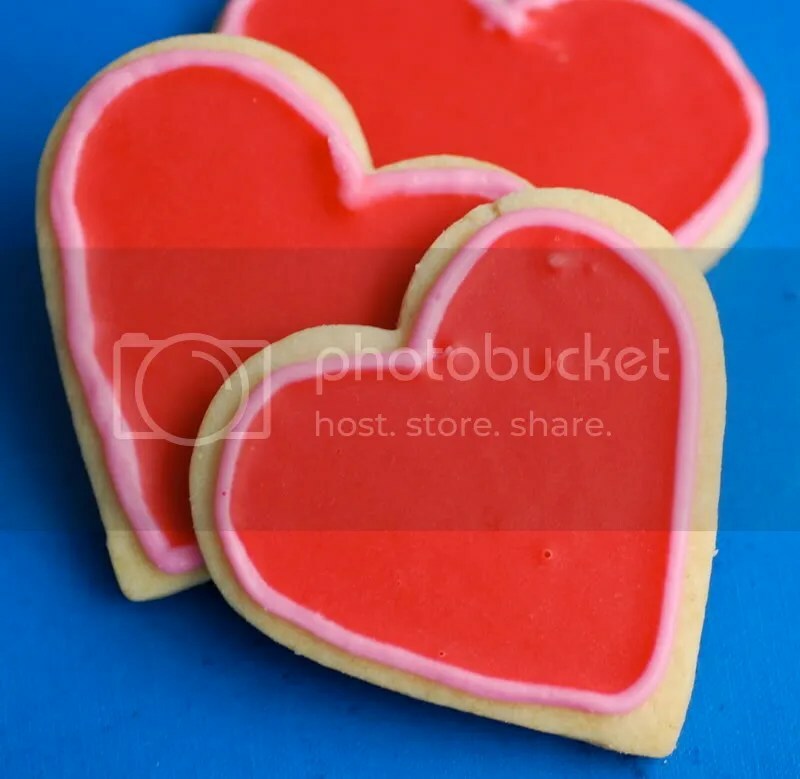 Cut into desired shapes, and transfer to prepared baking sheets. Repeat with remaining dough ball and scraps. 4. Bake cookies 15 to 17 minutes, or until light brown around edges. Cool 10 minutes on baking sheets, then transfer to wire rack to cool completely. 5. To make icing, combine the dry ingredients in a bowl. Add 1 tablespoon of water and stir. Add the almond extract and food coloring and stir. Continue to add water a little bit at a time until desired consistency (thick toothpaste) is reached. If it gets watery or drippy, add more sugar. 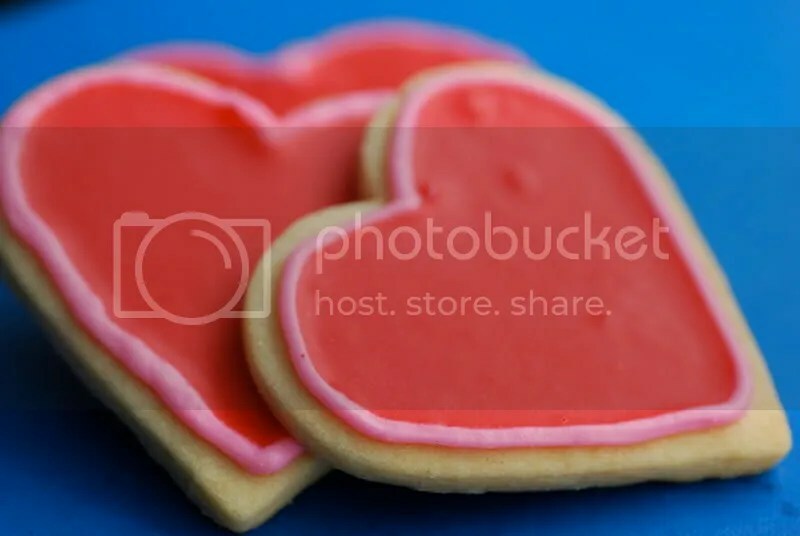 What I did: I tinted my icing with pink food coloring, and then used my mechanical pastry bag with the #1 tip to draw the heart outlines around the cookies. I let them sit for about 20 minutes. I then tinted the frosting (the same pink frosting used for the outlines) red and added water until it was a runnier consistency (like that of melted ice cream). 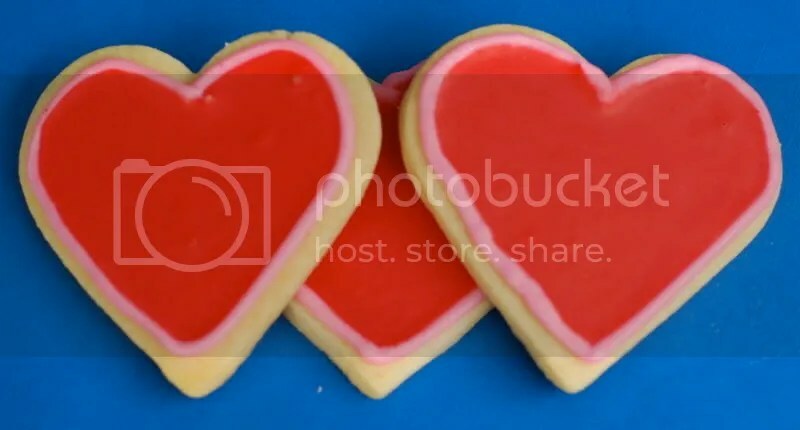 I used a spoon to place icing in the center of each heart cookie and used the back of the spoon to spread the icing to all of the edges. I then let them sit out overnight for the icing to set (no worries about the cookies hardening – the icing will keep them moist). Voila! My first attempt at the “flooding technique” with royal icing was a resounding success! Nice shots!…Curious if VT said what kind of food coloring they used. Usually they are really specific about it and I know that they are aware of traditional red food color containing carmine…hmm, would love to know if you have the original recipe. Dan – Thanks for the enthusiasm! Wow Gail. You’re on a vegan blogging RAMPAGE right now. Good work! Jennifer – I will be sure to make a batch next we see each other. This post inpired me to make frosted Christmas cookies. Thanks!